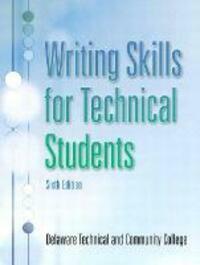 Writing Skills for Technical Students, 6/e, is a self-paced text/workbook designed for the non-traditional student who needs a review of grammar and writing skills in order to write clearly and concisely on the job. It provides diagnosis, instruction, and practice in 15 individualized instructional modules. There are also 12 grammar modules, a module on paragraph writing, a module on report writing, and a module on business letter writing. Each module includes a statement of objectives followed by instruction and practice in small segments with immediate feedback.